One of the things I encounter on almost a daily basis is when I call a customer, and they assume I'm from the call center. They assume I'm sitting in an office somewhere, behind some screen that's telling me who to call and following some sort of prompt as to what to say. I constantly have people say things like, "Where's the technician? They told me he would be here at "x:yz" time and he's not here yet. ", to which I respond by stating that I am the technician and I'm on my way. Some people still don't understand, and I have even been YELLED at by customers over the phone. Sometimes during these calls the customer just zones out. I will state that I'm on my way, and I will still get responses like, "Oh is he here? I don't see him outside." I constantly wonder how these calls get so misconstrued when I've barely spoken more than two sentences to this person. Do they assume they already know what I'm going to say and therefore feel they have no necessity to pay attention? The best ones are when a customer will start yelling and screaming at me over the phone, because they assume I'm just another call center jockey sitting behind a desk. When I'm finally able to explain to the customer (well not just explain but actually get them to comprehend which is an even bigger challenge) that I, this person they are conversing with AT THIS VERY MOMENT, is the person who will be at their place of residence in less than 30 minutes, you'd be amazed at how quickly their attitude and demeanor changes. People have absolutely NO SHAME about yelling and sometimes even berating people whom they've never met during a phone call. They take their anger out on the person on the other end of the line, because in their minds, it's someone they have never met and will never meet. To them, that call center person is just a faceless voice, no different than if they were to scream at a recording. But when they realize that they are talking to the person who very shortly will be in their presence, and in their HOME, their behavior does a complete 180. Once I'm at their place, they apologize profusely and sometimes they seem to not know how to act around me. I've even had one guy literally say to me, "I'm sorry I yelled at you, I didn't know you were the technician." - as though it would've been okay for him to yell at me if I wasn't? Seriously?!?! The misconception of the technician being male is so ingrained in our society. It's evident to me on a daily basis simply by these false assumptions made by the customers. I do think gender plays a big part in it. They hear my voice, recognize that I am female, and that connection between "female" and "technician" just doesn't exist in their mind. This is one of the things that really intrigues me the most, because it's really the most challenging of all - how do us females gain ACCEPTANCE in a male dominated industry? Not just with our coworkers, company or industry - but with the customers as well? Faster than a speeding tortoise. Some of you may have already seen this video, but I figured with my first few posts being more serious it was time to lighten it up. At one of my previous jobs, I was mostly in yards and rarely inside houses. Therefore, I carried a "dog stick" to fend off any aggressive dogs that I could potentially encounter. But I'm pretty sure that I never had any training on how to deal with this sort of situation. I know it's silly, but I swear, this tortoise has record setting speeds...or at least it seemed that way. ;) The lady that came into the yard did tell me that he DOES bite, so I am glad I kept away from him! And yes, I did call it a turtle at the end. It was a wacky situation and I just wanted to get the tortoise out of my way so I could do my job! One sure thing about having a job that takes you into peoples homes and yards is that you never know what you're going to come across. It's a surprise every time! Customer Confidence (and lack thereof). Every customer I meet is different. And yet, there are certain similarities that tend to pop up and most people fall into one of two groups: those who have confidence in me and my work, and those who for whatever reason feel that I am inferior. Now, it is debatable as to whether or not "being inferior" is relative to "being female", but in some cases the customer makes that correlation blatantly obvious. For instance, I went to a house once and a woman answered the door. I could see the look of confusion on her face when I introduced myself and explained what I was there for, but I shrugged it off. It's not uncommon for people to be surprised to see a female technician. Customers will comment on it all the time; usually it's something like, "Oh, it's so nice to see a woman technician!" but not in this case. Immediately after introducing myself, the lady asked if I was working by myself, to which I said yes. She then stated, "Oh, well are you sure you can do this by yourself?". I had never really had anyone ask me questions like this mere seconds after arriving at their house, and BEFORE I even started any inquiries as to what work would need to be done! After assuring the woman that yes, in fact I was able to do this work by myself and I would not be having anyone else come out to help me, I entered her house and started evaluating the job. I started working and within a couple minutes the lady came up to me and asked, "Are you sure you know what you're doing?". This was the point where I started to get frustrated. The lady had such a lack of confidence in me and my work that I honestly didn't even feel like helping her at that point. I had a fleeting thought of just dropping all my tools midway through and saying to her, "You know what, you're right! I can't do this! I'll have to send someone else to come at a later date. ", not because I couldn't do the job, but because I was fed up with her attitude and figured if she didn't think my work would be adequate why not just leave and let someone else deal with her? But I had to keep my professional demeanor and I simply responded, once again, that yes I was able to do the job and that I didn't need assistance. After the job was done she seemed surprised once again, but I didn't get any sort of apology or sign of appreciation for the work I had done. Now one could argue that the woman was simply doubtful of my work and that my gender didn't have anything to do with it. But from my point of view, I could tell in the way she said it what her underlying meaning was. The other negatively charged question I get asked a lot is, "I thought they were sending a senior technician. ", as though for some reason, their first impression of me is that I'm not senior tech (which I am). I have yet to figure out why people assume this, but I do think that in some of the cases it is probably gender based. As frustrating as these comments are, I still have to work through it. Some days I have a hard time working after people have this attitude towards me. And other days, I use those comments as fuel to push me harder to PROVE my work. I strive to always have it be the latter of the two, but we all just have those days. It's not all negative though, sometimes I am pleasantly surprised by the confidence that customers have in me even before I've started to work! It's always nice to go to a house and have the person at the door tell me how glad they are that I'm there to help. If everyone treated technicians that way, regardless of their gender, the blue collar world would be a much happier place. Sometimes, actually quite a lot, I get gender bias positive comments from customers, usually something like, "It takes a woman to do a man's job!" or "It just needed a woman's touch!" or "If you want it done right, have a woman do it!" It's always nice to get compliments, but I still get that tinge in the back of my brain when people say things like this, because what's wrong with it just being a good job because I'm a good technician? What does being a woman have to do with it, regardless of whether it's a great job or a horrible job? Usually by the time I'm done with the job I've gained the customers confidence and approval. Sometimes I've had to win them over with seeing how I work, and sometimes it's just about relaying the knowledge to the customer. But it's still not the same as working for people who never questioned my ability from the second they answered the door. Regardless of gender or assumptions a customer has before I even step foot in their house, I'm simply there for one reason and that is to do my job. Otherwise I wouldn't have my job in the first place! Another year older and an awe inspiring encounter. I originally had today scheduled off. But then I figured, why do I need the WHOLE day off for my birthday? So I changed my schedule to request a half day off instead. But apparently by doing so, I removed my whole day and a coworker's pending request for the day off went through before my "new" request for the half day went through. So my request was denied. I talked with my manager about it and he didn't really offer any resolution. No big deal really, it's just another day. So I worked today and in retrospect, I'm glad I did. Because if I hadn't I probably never would've had this encounter that made my birthday extra special. My job tends to be very serendipitous at times, and today was one of those days. I don't really believe in "fate" per se, but I do believe that sometimes things simply fall into place perfectly. Today I met a woman who was in a motorcycle accident 9 years ago that left her with permanent brain damage. Her life was completely turned upside down after a motorist decided not to check his blind spot before changing lanes - being that I ride a motorcycle myself, I know the harsh reality of how often this happens. There's a saying that the most dangerous part about riding a motorcycle isn't the bike or the rider, it's the other cars around you. And this woman's story is proof of that. 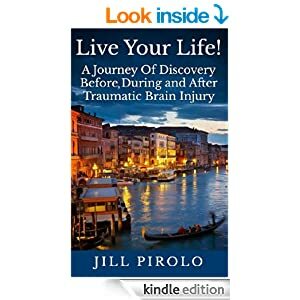 Despite her unfortunate circumstances, she has managed to move forward with her life and has even written a book about her experiences before, during, and after the accident. And it is published! You can get it here on Amazon. I'm going to charge my kindle and get the book as soon as I can. Even though I was only at her place for about 30 minutes, I was truly inspired by this woman and all she has accomplished. The timing couldn't have been any more perfect given that I just started writing this blog yesterday, and one of my dreams is to have a book published. When I left her place and got back into my work vehicle, I sat there for a few minutes just trying to sort through all the thoughts in my head. I was extremely inspired and I feel like this encounter definitely reaffirmed my decision to start this blog. I started thinking about how grateful I was for everything I have in my life and I actually shed a few tears when I thought about how fortunate I am. Both my fiancé and I have been in (separate) motorcycle accidents and have come out relatively unscathed. We are extremely lucky, things could have been a lot worse. I'm 29 years old today. And today I contemplated what I've done with my life up to this point. I think it's really hard to grasp the concept of mortality. It's really hard to be grateful for what you have. But then something, or someone comes along and flicks the switch inside your head that gives you the clarity needed to truly comprehend how fragile life is. And I don't want to waste another minute of it. It's days like today that really make me love what I do. Despite the ups and downs that come with this job and this industry in general, I love that I get to meet some of the most interesting and amazing people. I never know what the day is going to bring, and that is a beautiful thing. I recently went to a house owned by a lovely British couple who have lived here in the states for over 20 years. They own a business together and were moving it from a commercial building to a renovated room in their house in order to save on monthly expenses. Even though they live here, they do a lot of their work overseas and are in the generalized "public relations" field. While I was working at their house, we got to talking about how I got into this industry of being a field technician. Being a technician is not a common job for a woman to be in, in fact on almost a daily basis a customer will comment that I'm the first woman technician they've seen. When it comes to utilities, it's a male dominated industry. HEAVILY male dominated. And as much as we as Americans would like to tout how progressive our country is and how far we've come, there are still many areas in which there is a lot of room for growth. Having worked in male dominated job industries for the last 10 years, I have seen and experienced more than my fair share of prejudice and discrimination simply because of the jobs I choose. And when you talk to pretty much ANY female who works in jobs like this, the consensus is the same - it comes with the territory. Because I CHOSE to have a "man's" job, I'm surrounded by men and am expected to put up with everything that comes along with it. And if not, well I'm the minority here and they can and WILL find a way to eventually push you out. But I push back. I don't give up or give in that easily. I work harder and smarter than most of the guys. I'm proud of the work I do, and I enjoy working in this industry. I will keep working hard and I will work my way up in the company with the hopes that someday, I will be in a position to work towards eliminating the stereotype that there are some jobs that only men can do. But until then, I'll just have to do what I know how to do best - write. It's the British couple that came up with the idea. While discussing my job with them, the husband flat out asked me, "If you could do anything and get paid to do it, what would you do?" I told him I want to travel and write. That is really my ideal job, but I told him I didn't see anyway to make that possible. He disagreed and told me something I'll never forget. He told me to start simple, and write about what you know. That is where the best stories come from. The travel, well that would probably come later down the line. But for now, I'm finally taking his advice and I'm going to do what I love and write about what I know. This blog is about the adventures and turmoils that I've encountered over the last 10 years while working blue collar jobs in male dominated industries. As Mike Rowe would say, it's a dirty job, but somebody's gotta do it.